The all-new Winnebago Revel 4×4 is a true four season RV which is possible because of its diesel-fired hydronic heating system. The diesel-fired heating system provides continuous, unlimited hot water that will heat the coach, and the holding tanks to keep them from freezing. The diesel burner that fires the heating system uses the main diesel fuel tank to heat a glycol mixture that is circulated through heat exchangers throughout the for coach. The Revel fresh water tank and drainage tank are below the floor which are held heavily insulated and both have a glycol line that runs along the edge of the tank to heat the tanks. Essentially, Winnebago has eliminated your propane furnace and propane water heater in the Revel. With an espar heater for your RV you can be completely comfortable in all-weather even subfreezing temperatures. Espar heaters offer the option of cabin heating, engine or coolant heating, and even water heating for your domestic water supply. Heaters are highly efficient and paired with an Espar controller, are easy to operate and low cost to maintain. In the Winnebago Revel 4×4 you will be able to enjoy the great outdoors and the open road without compromising your comfort anywhere you go. 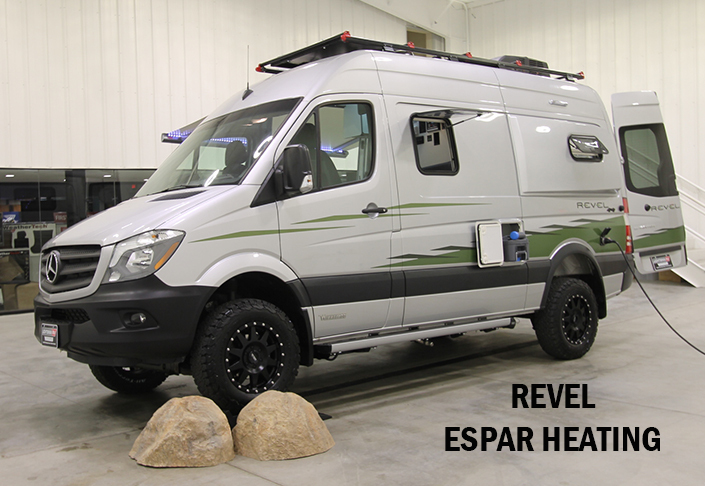 Winnebago Industries uses the Eberspaecher Climate Control System’s Hydronic D5 coolant heater series in the Revel 4×4. To see our entire stock of Winnebago Revel 4×4 inventory CLICK HERE! To find out more about the New Winnebago Revel 4×4 and Espar Heating please call Lichtsinn RV today!